What: Excursion to Key West and Glass Bottom Boat ride. Don’t Miss: Seeing the teeming marine life in Key West’s coral reef. This exciting full-day tour takes you to Key West where you can enjoy the fun Caribbean atmosphere, street artists, outdoor cafes and a two-hour Glass Bottom Boat ride to the stunning Key West coral reef, the third largest reef in the world. Cross 42 bridges and hop 32 islands before reaching the southernmost city – Key West. 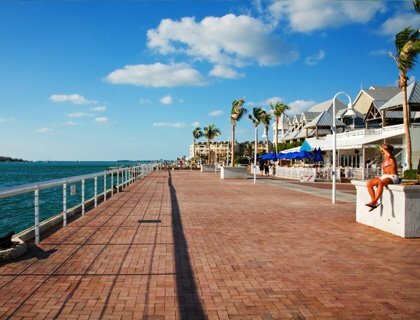 Enjoy free-time to experience Key West’s Caribbean atmosphere. Sail on a Glass Bottom Boat ride to the coral reef off of Key West. See the teeming, colourful marine-life that lives in the warm, Key West waters, usually only seen by divers and snorkelers. Cross 42 bridges and hop 32 islands before reaching the southernmost city in the continental U.S., Key West. Enjoy free-time to experience Key West’s Caribbean atmosphere complete with street artists, outdoor cafes and restaurants. This tour also includes a Glass Bottom Boat ride to the coral reef off of Key West - the 3rd largest reef in the world and home to a variety of plants and animals. Enjoy a snack on board the boat, before beginning the return journey to your Miami hotel. Round-trip transfers are included from Regency Hotel Miami Airport 1000 NW LeJeune Rd. Miami 33126. Rest stops are included during both outward and return journeys. Between 7.30am and 7.35am at the main entrance of the Regency Hotel. Please allow a full day for this tour (approx 12 hours). Free time in Key West will be from 12pm to 6pm. Your driver/guide will give you instructions on how and when to get to the Glass Bottom Boat. Glass Bottom Boat ride in Key West.